It was so cold Thanksgiving night that everything firefighters hosed down turned to ice, and the house they were trying to save was destroyed. A Lynn, Massachusetts family is picking up the pieces after a fire tore through their triple decker home on Thanksgiving. Frigid temperatures and wind made battling the flames tough, according to fire officials. It was so cold Thursday night that everything firefighters hosed down turned to ice. The family that owns the Grover Street home has lived there for more than 20 years, but as they were finishing their Thanksgiving dinner around 8:30 p.m., they had to watch from the street as a fire burned through it all. “We lived there so long so I don’t know what to do right now,” Sonny Prum said. Eric To says as they were enjoying each other’s company on the holiday, smoke began to billow out, sending the entire family into the street. The Lynn Fire Department determined the fire was caused by an electrical issue that began in the basement and quickly spread, destroying the apartments that 17 family members all share. The family is now dealing with the aftermath. While the inside of the house will have to be gutted, they are hoping to save the outside. While they had no time on Thanksgiving to grab anything as they rushed out, they’re just grateful everyone could get out together. “We are all together, we are all safe, that’s all that matters,” To said. The 17 family members stayed with friends and relatives Thanksgiving night but they’re not yet sure where they will all spend the next few weeks and months. There are more in-home fires during the holiday season than at any other time of the year, according to data from the National Fire Protection Association. 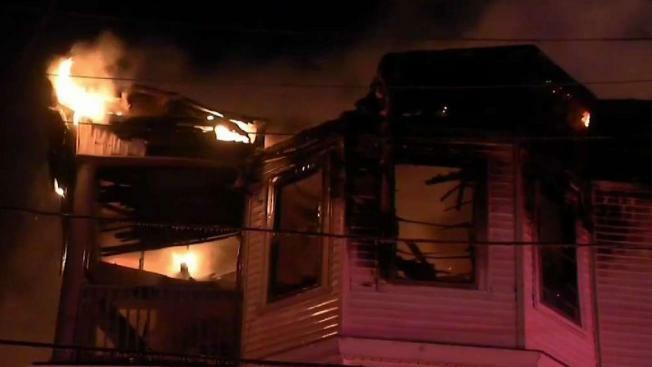 Two other fires were reported Thanksgiving evening in Massachusetts. One fire was in Medford, while another fire in Lowell started at one home, then quickly spread to two other homes.